Out of hot water when your customers or guests need it most? What can you as a business owner do to prevent this giant headache from happening? Consider two important factors in the world of water heaters – using only trained technicians and renting your water heater and other related equipment. 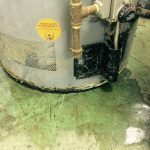 Although in days gone by, a general maintenance person could have handled fixing an older water heater unit – it’s just not the case in today’s modern era of computerized everything. Your water heater is a highly sensitive piece of equipment that must be repaired by someone with the proper training. They can diagnose a problem quickly and accurately, change out parts correctly and safely, and know when it’s time to replace your equipment. Secondly, renting your water heating equipment is a headache-free way to ensure you are never out of hot water again. With your rental plan from Reliable Water Services, you’ll have access to trained technicians 24/7. And when that equipment fails you won’t have to spend giant sums of money on buying new equipment. A win-win!